I don’t know how I managed to get this far and not read this one. Everyone says it’s a classic. Everyone says you have to at least read something Orson Scott Card before you can call yourself a sci-fi geek. But somehow I missed it, so I’m reading it now. I have to admit, I’m torn about what to say. People have such strong opinions about this book – you either love it or you hate it, going by the reviews I wandered through on GoodReads. The truth is, yes, it’s a great sci-fi and I can’t believe I haven’t read it, but it just didn’t stand up to my favourites (probably because it is sci-fi – I like it, but fantasy is more to my taste). I do like how complex the storyline is. Ender is just a kid, but he is dealing with very adult emotions. If anyone ever set up a system like that while I was around I’d be the first to start (or join) a rebellion. Children shouldn’t have to live through what they made Ender do, no matter what the consequences are. We keep getting reminders that Ender is not an adult, and that he shouldn’t be in this situation, but at the same time it is easy to forget that he is as young as he is. He’s already way past his classmates by the time they take him at 6. By the time they’ve put him through all the training, he might as well be my age for all I know, and how he acts. The sad part is, while they were in battle school playing the null gravity games, I kind of wanted to be there. I wanted to play the games, because the games sound fun. Yeah, if you think about what they were for it seems awful, but the games themselves present challenges and competition, which is what I always wanted from games as a kid. Then again, I’m very competitive and I love logicking out the solution to whatever problems are set for me, and that’s basically what they were having Ender do. I guess there’s not much else to say that hasn’t already been said. 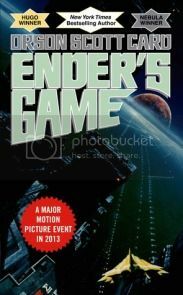 Lots of people loved Ender’s Game when it came out, and I’m just the latest in a long line of reviewers. But hey, if you like sci-fi, then you should read this one. It’s like liking fantasy and not reading Harry Potter – difficult to do, and kind of sad for the rest of us.